London: 16/4/18 – Nuvias, the fast-growing value-added distributor, has signed a pan-EMEA distributor agreement with innovative Scandinavian start-up Huddly for its ground-breaking intelligent collaboration camera. 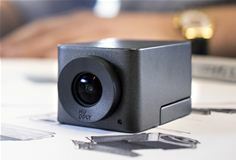 The ultra-compact and stylish Huddly GO offers advanced features such as an ultra-wide 150-degree lens, lossless digital Pan-Tilt-Zoom (PTZ) up to 4x, and 16 MP video – all at a fraction of the cost of existing high-end PTZ video conferencing cameras. This new pocket-sized, USB-powered camera, with dynamic light optimisation and visual noise filtering, delivers high-quality images whatever the location and conditions. And, with an ultra-wide field of vision, Huddly GO captures everyone in the room, even in the tightest spaces, making it ideal for ‘huddle rooms’, mid-size conference rooms and large open environments. With the Huddly App users also get regular software upgrades to improve image quality and performance, while the Huddly Vision API makes it possible to develop advanced intelligent features using the camera’s multiple video streams.